The Emergency Recovery Utility is a small program that can help you restore control of Folder Guard if you ever forget its Master Password. It is especially important to have the Emergency Recovery Utility available if you are going to configure Folder Guard to operate in the stealth mode, because you will have no way of disabling the protection or running Folder Guard without the Emergency Recovery Utility! 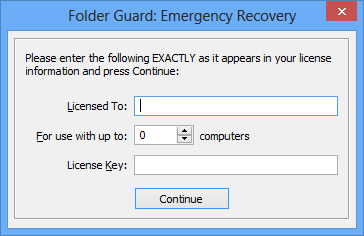 You can also open this window by using the Emergency Recovery command on the Tools menu of Folder Guard. To actually create the Emergency Recovery Utility, press the Create... button on the window shown above, and then navigate to the folder where you want to store the file of the Emergency Recovery Utility. This should be a folder separate from the installation folder of Folder Guard, because when the stealth mode is enabled, the installation folder will be hidden from you, and you will not be able to run the Emergency Recovery Utility from it! A better choice would be to store the file on a USB or some other removable disk, and store that disk in a safe location. The Emergency Recovery Utility is also available for free download from our web site. You may find this option useful if you cannot locate the copy of the Emergency Recovery Utility that you yourself have created as described above. However, even though we make the Emergency Recovery Utility available for download from our web site, we still strongly recommend creating and storing a local copy of it by yourself, because when the need to use the emergency recovery procedure arises, you may not have handy access to the Internet available to download the file. This step is necessary to stop other users from using the Emergency Recovery Utility to remove protection without your permission. 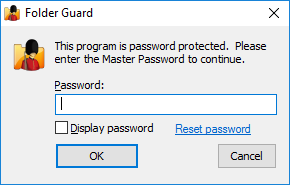 If you have not purchased a license yet, and your copy of Folder Guard is operating in the evaluation mode, simply press the Continue button, and it will perform the Emergency Recovery procedure: the Master Password will be erased, and the protection of your computer will be disabled. If you don't want anyone to be able to use the Emergency Recovery Utility to erase your password and disable the protection, simply purchase a license for continued use of Folder Guard, and enter your license key into the program. This way, only you will be able to use the Emergency Recovery Utility, since it will not proceed unless a valid license key is entered into it first.